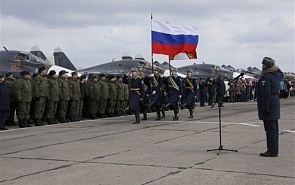 Russian military group’s withdrawal doesn’t mean Russia is leaving Syria altogether. Many questions arose following the announcement that Russia is withdrawing the bulk of its troops from Syria. Some experts believe Russia hasn’t achieved its goals in Syria. Others, on the contrary, are convinced that Russia could use the decision to withdraw its troops as another political lever. Ambassador Extraordinary and Plenipotentiary Alexander Aksenyonok shared his view of the situation with the Valdai Club’s editorial board. According to him, the decision to withdraw the bulk of the troops and the fact that it was coordinated with Syrian President Bashar al-Assad are important in many ways. “First of all, it expands the possibilities for stepping up activities related to a political settlement, which are now based on international law, and the foundations of which were laid in the most recent Russia-US agreement. The issue concerns facilitating the cessation of hostilities,” the expert said. Furthermore, as follows from the Russian president’s statement, the Russian military group’s withdrawal doesn’t mean Russia is leaving Syria altogether. “The fact is we are still able to control the airspace; we have an airbase in Hmeymim. We also have expanded the Russian Navy’s presence in the Mediterranean port of Tartus,” Aksenyonok said. “For Russia’s critics in the West, it should serve as a signal that Russia has complied with its international obligations and that it intends, in conjunction with its Western and regional partners, to help Syrians reach an agreement on national reconciliation and form new bodies of government, while preserving Syrian statehood,” Aksenyonok said. Aksenyonok noted that, according to rumors, Russia pulled out from Syria without achieving its goals, such as to supposedly destroy ISIS (or Daesh, banned in Russia). However, he said destroying ISIS in Syria was not the Russian military mission’s goal. “This is a lengthy process. It takes time and not just military, but also ideological efforts, including on behalf of the clergy, to debunk the myth that ISIS meets the current aspirations of Muslim people,” Aksenyonok said.